[By Don Low] I'm excited to be part of the 2016 USK Symposium, and even more so because this is going to be my first overseas symposium. And for this reason, I am also printing some publicity materials as an urban sketcher for the first time to be given out free to all my cool sketcher friends whom I am going to meet during the event, especially for the participants who are coming for my workshop. I think I have enough to go around. In anticipation of a colder climate, my wife and myself will be arriving in UK about 3 weeks earlier to get use to the weather, but I think I would love the cold. 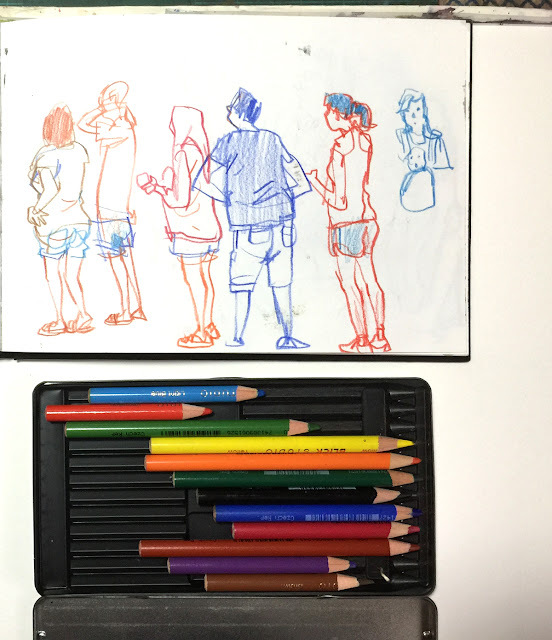 I would also like to take this opportunity to introduce myself by introducing some of the tools and materials I use more regularly when I go our sketching and painting. The Hero fountain pen 9018 is my work horse. I use it all the time. 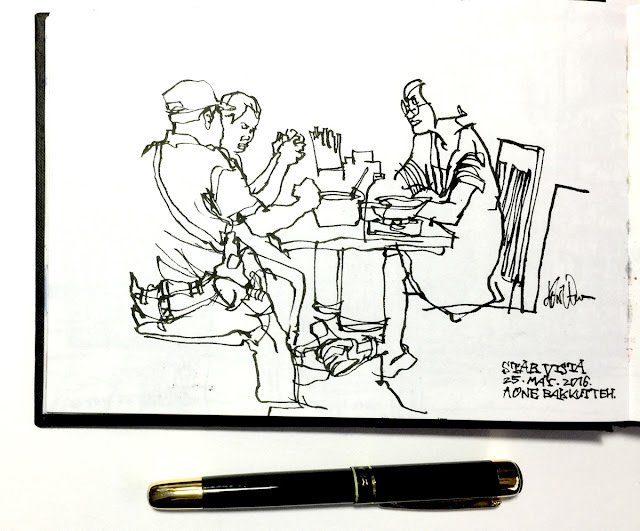 Recently I have been using other fountain pens like the Sailor Fude nib, and Pelikan M200. Every pen yields very different line characteristics and quality. I fill my fountain pens with Atramentis Archive Ink (Germany) which has good flow and easy on the nib. One thing I am not sure is how my pen would perform in the colder climate. The above shows a sketch done with the Pentel Pocket brush pen. 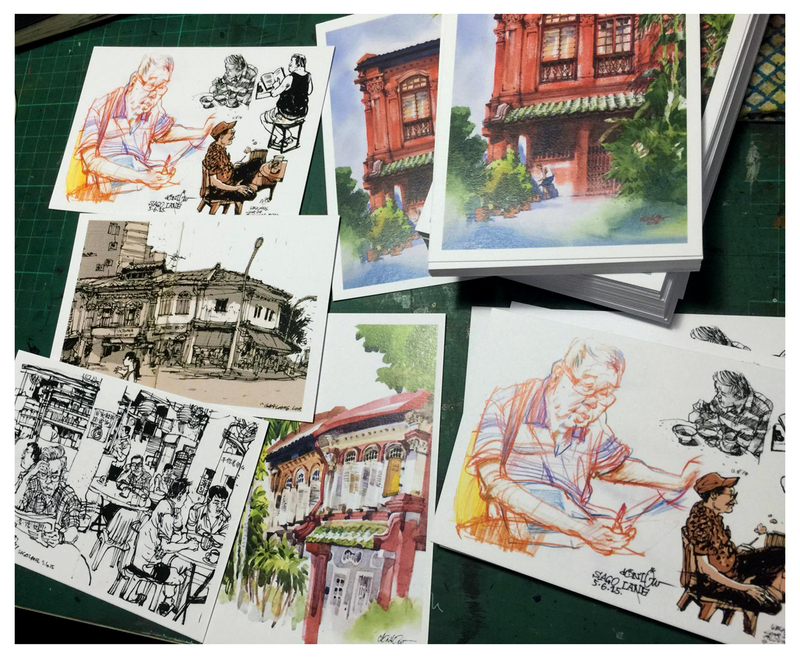 It comes with its own cartridge of permanent black ink which does not smudge if you paint over with watercolour. I love it because it gives me very fine lines (for details) as well as thick fat lines for filling in the dark areas. Ink flow is pretty good on my sketchbook (Clairefontaine Goldline) but it depends on how fast you draw. Sometimes I like to make fast strokes on paper to make dry brushing effects and add textural elements to a sketch. 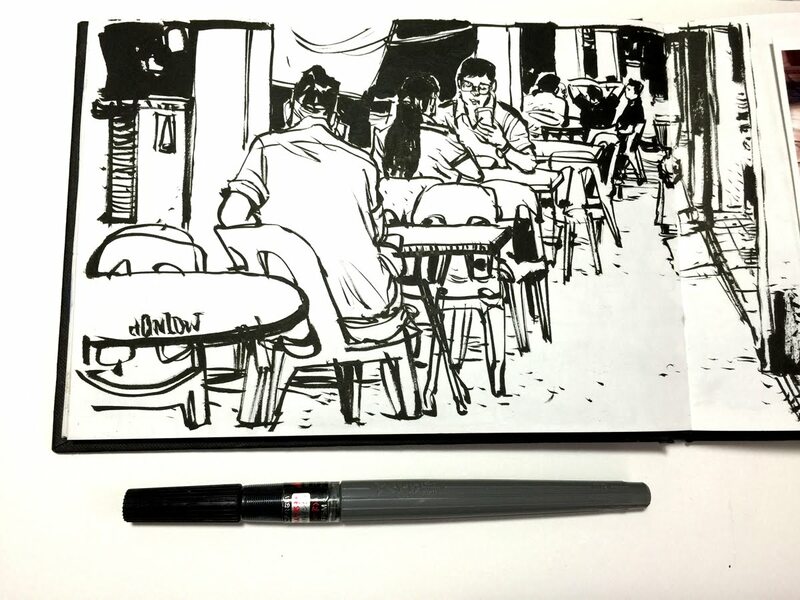 The other Pentel brush pen I use for sketching is show above. Comparing to the pocket sized brush pen, it comes larger with more bristles. The grey portion is the ink cartridge. If you have the black coloured cartridge, the ink is not waterproof. I use the latter for adding ink washes by working with water. Similarly, the brush pen gives quite fine lines while it is really convenient to fill in the dark areas. Coloured pencils allow for quick drawing too. My favourite brand is Blicks coloured pencils. They are brilliant, transparent and very saturated with pigment. I ordered these online through their website. I carry a Rembrandt metal box with customised hue choices for my watercolours. If I am not painting anything larger than A4, I would use a Holbein water brush pen to apply my paint. 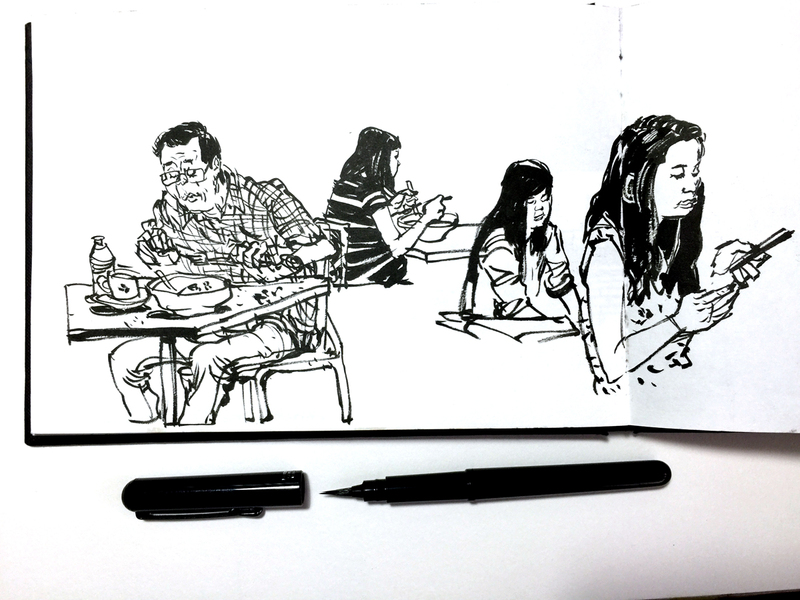 Make sure you carry an extra water bottle to refill the brush pen whenever the water runs out. At this moment the hues in the mobile box are: Azo Yellow or Cadmium Yellow, Cadmium Red, Alizarin Crimson, Mauve, Burnt Sienna, Ultramarine Blue, Cobalt Blue, and Lamp Black. 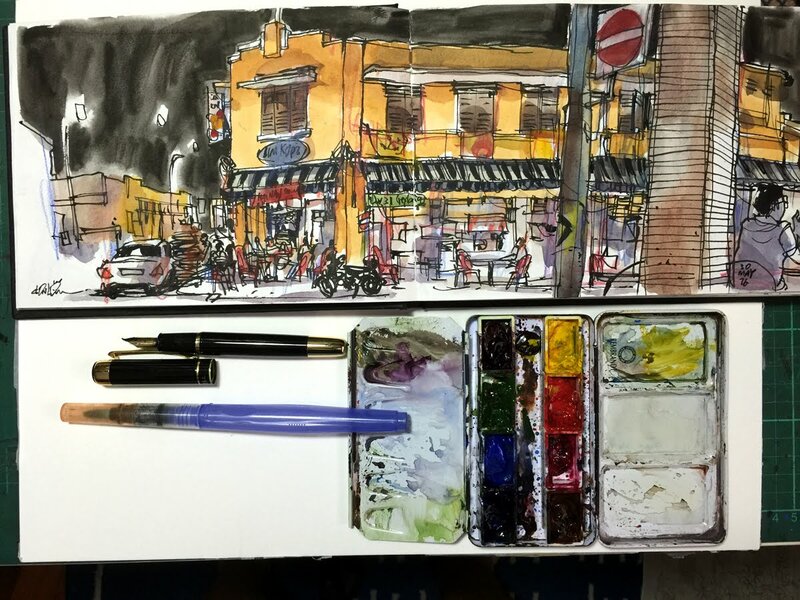 I switch around quite often between M. Graham, Winsor Newton, and Danial Smith watercolours.